Request For Proposal (RFP) – A type of bidding solicitation in which a company or organization announces that funding is available for a particular project or program, and companies can place bids for the project’s completion. The Request For Proposal (RFP) outlines the bidding process and contract terms, and provides guidance on how the bid should be formatted and presented. A RFP is typically open to a wide range of bidders, creating open competition between companies looking for work. On February 26th, a resolution to award $234,000, plus reimbursable expenses, to Wold Architects and Engineers was moved. I voted no on this resolution due to the lack of securing a Request for Proposal (RFP). The courthouse renovation is a four phase project. Phases 1 and 2 were awarded to Wold in October of 2013, and at that time, no other proposals were solicited. It was agreed, at that time, to award phases 3 and 4 to Wold, although it was uncertain when phase 3 and 4 would be done. With no other proposals received for the architectural and engineering design services, I could not insure that the best design for the best price was obtained, and cast a no vote. The award for phase 1 and 2 was $1,928,000. Wold’s portion of this was $116,625.00. The estimated cost of phase 3 and 4 is $3,862,786.00, which includes Wold’s fee of $234,000. 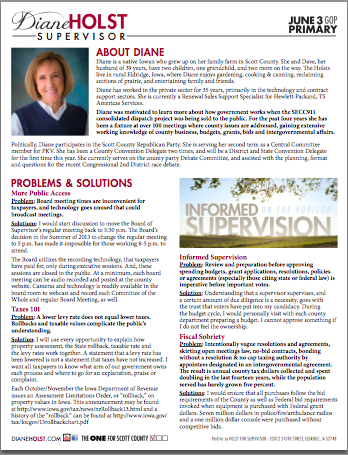 If you would like to talk to me about this or any other vote I make, please contact me at 563-271-2601, or email me at info@dianeholst.com or diane.holst@scottcountyiowa.com.